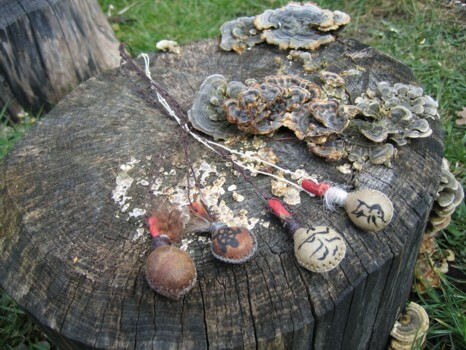 The very essence in shamanism is that all life is connected and that everything has a soul. 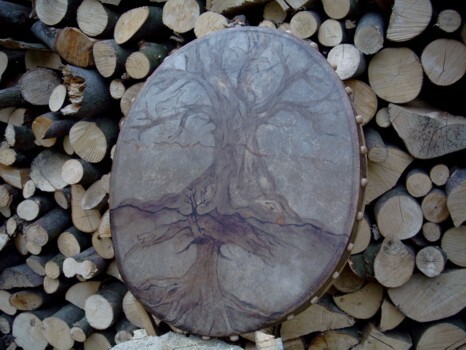 That concept also covers the animal and the tree used to create a drum or a rattle. 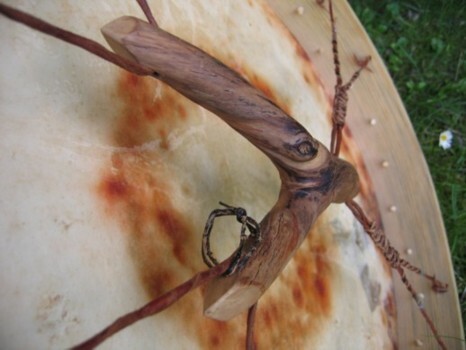 To build a shaman drum based on the shamanic principals is like creating a highly specialized tool in cooperation with the Power Animals and spiritual guides. .... and the mere craftsmanship required to perform the actual tasks. 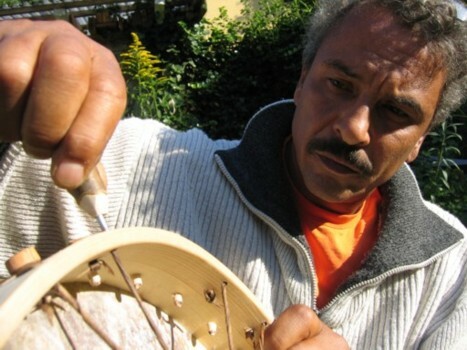 To build the drum or the rattle is a new and exciting process every time! We use solid pine, birch or ash for making the frame. 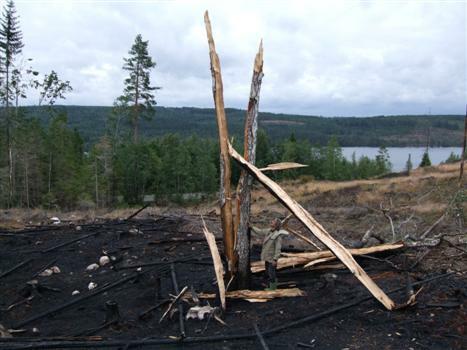 The wood is carefully chosen. 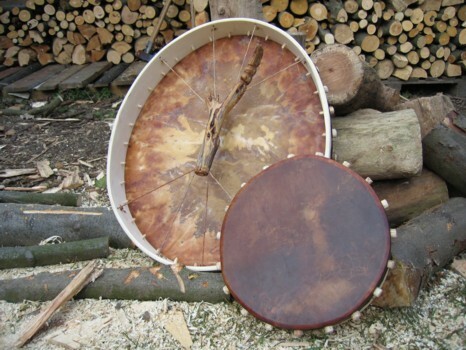 - at times even when still living in the woods.The drums vary in size and shape due to different strength and flexibility. 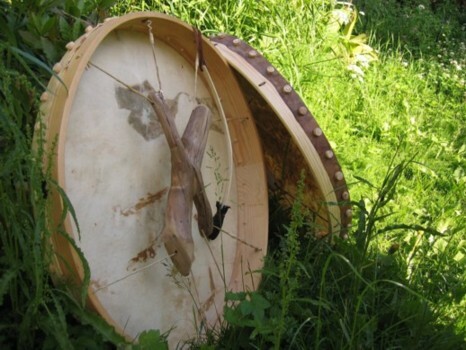 The sizes of our drums vary from 30 to 55 cm. diameter. The drum head is either hide from reindeer, goat, or deer. 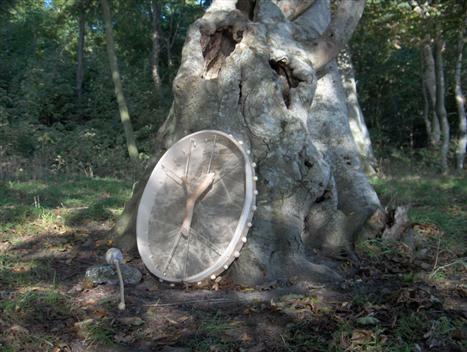 Some drums even invite for the residing power to be enhanced (like on the drum above) or to be supported by the presence of symbols. The suspended handle secures an optimal resonance and an abundance of fine harmonics. We use branches for drum sticks. We use leather or felt of wool for the batter. 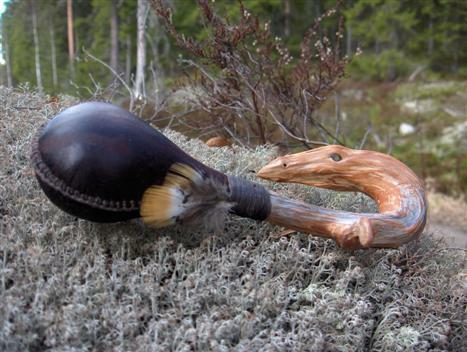 The leather rattle is made out of reindeer hide, sewn into the desired shape. 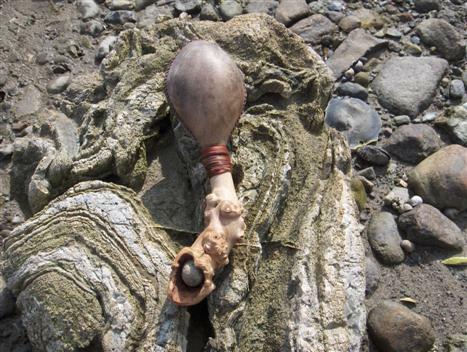 Inside of it is either beans, olive kernels, or pebbles collected at the sea shore. 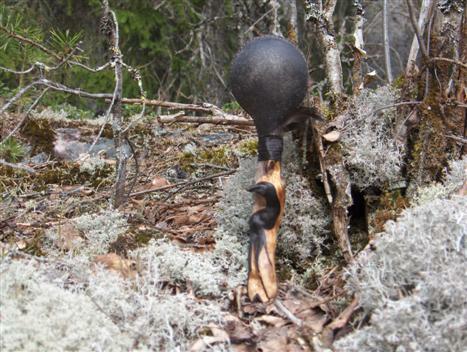 The rattles vary in size and energy. 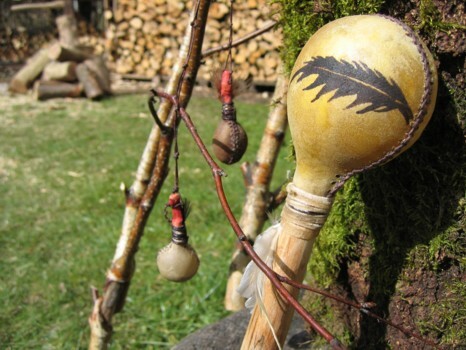 The nut rattle is made of hassle nuts and has a particular "rattling in the wind" sensation to it. The shells are either kept natural or they are died with plant die. We use woods like juniper root, thuja, or hawthorn. Every new rattle is unique in its own way. 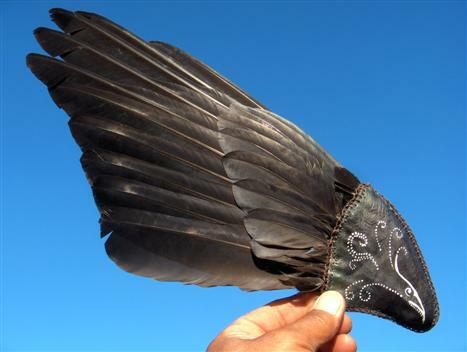 Smudge fans are made out of feathers from birds in our area. 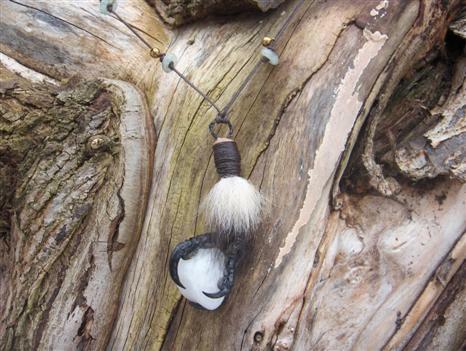 Among other things a Smudge fan can be used with Incense and for Healing. 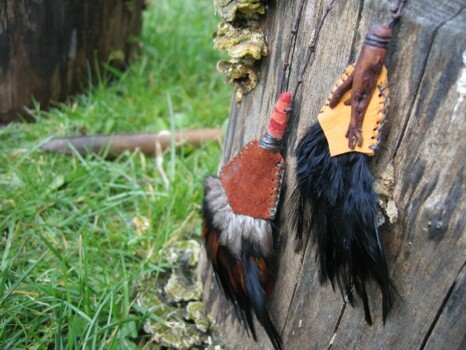 The feathers can be mounted on a handle made from different types of wood. 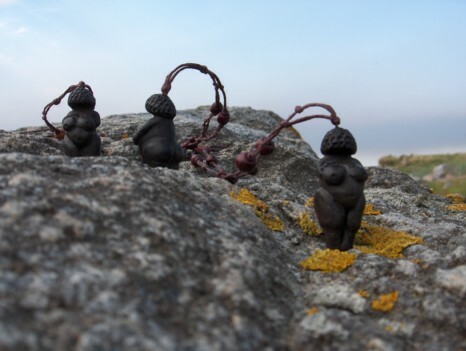 The little "Earth Mother" figurine, is made as power jewelry. It is made out of clay and fired. The ashes from different herbs have been used to apply various color nuances to the clay. As they are all handmade the vary in size from 3 to 4 1/2 cm. ...so small you can hang them around your neck. 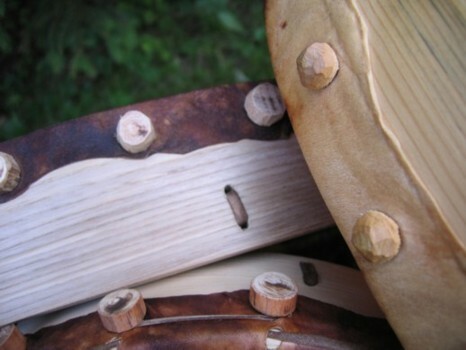 Mini Smudge fans can be used as jewelry or can be used for decorating your drum. There is great power residing in even small things! 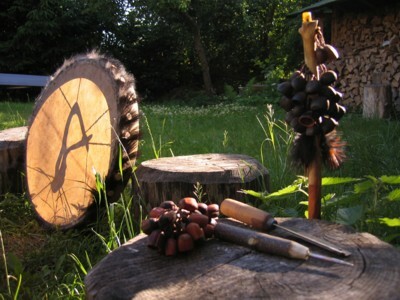 “A Shamanic workshop … A place with many Spirits”. 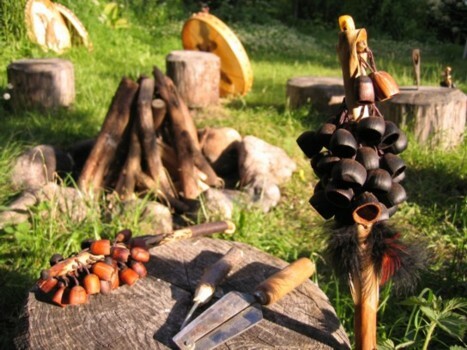 To describe some more about how people experience the shamanic power within shamanism and using shamanic tools. their experience that they have shared with us. With Thanks for the sharing. I received my magnificent drum today! I cannot begin to thank you enough for bringing her forth. She was greeted with a juniper smudge and copal blessings. Her skin has been dampened and her sound is beautiful. As I picked her up and started to bless her I heard her name as Spirit Walker. It’s hard to find words to express my feelings. They are full of joy and gratitude. I’ve waited a long time to find her. The drum stick is wonderful and I love the wolf hair around the bottom. Your work is beautiful and I am so grateful to walk this earth at the same time together. Black Eagle came last week. This past weekend I had time to engage with her. She took me on a few little journeys. It did not take long for me to meet up with my guide/power animal. The drum sounds beautiful. It seemed as if I was running with a herd of reindeer as I traveled along side a river in the north with snow and ice. What a sight. And, then I flew alongside an eagle. I believe you were correct, Black Eagle was waiting to come home. I only hope I am worthy. 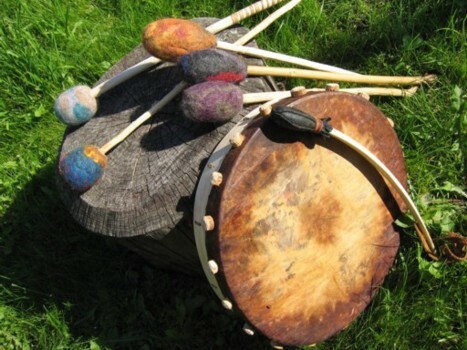 I am so happy with the rattle and drum that I purchased from you ! I am the envy of my Shamanic Healing group. 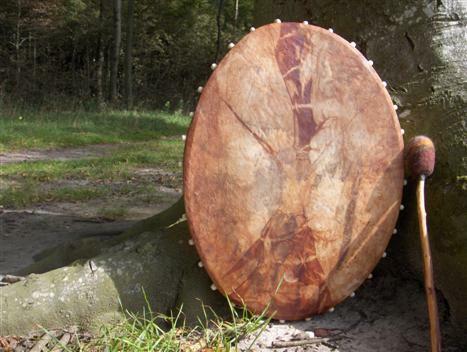 An elder has said that my drum is the finest drum he has ever seen. It is exceptional at calling in spirit ! Thank you, Eric & Susanne!